Sending a meeting request to multiple parties is often a shot in the dark. You might schedule a meeting with a PC user running Microsoft Outlook or, if you use Apple’s iCal ( ), you might try to set up a meeting with someone who uses a Web-based scheduler, such as Google Calendar ( ). TimeBridge, which bills itself as a “personal scheduling assistant,” makes it easy to schedule meetings, regardless of which scheduling tool people are using. Ingenious and well designed, TimeBridge has the potential to be a smart and useful product, but it lacks a few important features. I also uncovered several bugs during my test period, some of which were successfully resolved. A meeting request arrives in a participant’s inbox as a Web form with a large button that says Click Here to Reply. When an invitee replies, that person’s meeting preferences are recorded and matched with other invitees. For meeting participants, there’s no registration process, and no client to install. In fact, to accept a meeting, attendees do not even need to use any calendar software. Of course, there’s more to the tool than just meeting requests. The TimeBridge Connector, for example, syncs with Apple iCal automatically; so, if you create a new meeting in iCal, your meeting will appear in TimeBridge. This is an important feature, because TimeBridge also allows you to share a public calendar that shows only your busy times (to maintain privacy). You can even download widgets for social networking sites. For example, a Facebook widget lets anyone click to see your schedule. TimeBridge even offers a personal Web site to host your schedule. TimeBridge is missing a few important features, however. For one thing, it lets you sync with only one schedule at a time. It would be great if the program allowed you to aggregate a work schedule from iCal and a home schedule from Google Calendar. Secondly, the social networking applets show only your busy status; I’d prefer that they show a thumbnail of my calendar. And third, the program doesn’t support Microsoft Entourage (not because TimeBridge doesn’t want to, but because Microsoft does not allow third-party access to the schedule format). Entourage users can always download a confirmed calendar item to their own calendar. TimeBridge also does not work with popular standards such as vCal, and offers only limited support for Hotmail and Yahoo! services, such as a contact list import option. 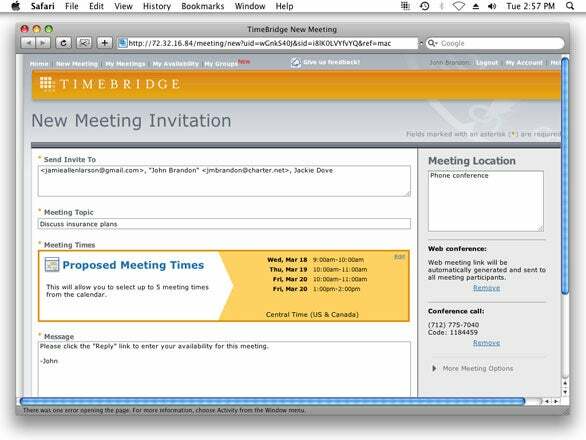 TimeBridge takes the guesswork out of scheduling a meeting, as it automates the process with other users. Its calendar syncing features are a letdown, though. During my testing period, a few bugs cropped up, and their ill effects were compounded because TimeBridge does not communicate problems to the user. For example, the iCal Connector—which syncs iCal with TimeBridge—did not work. After some troubleshooting, a TimeBridge engineer figured out that there is a minor bug on my Mac that interfered with resolving the app.timebridge.com domain—although other domains worked fine. A glitch with Google Calendar also caused problems with syncing. Turns out it was because I had not yet enabled the calendar (from Gmail, you just click the Calendar link and log in). I’d prefer that TimeBridge notify users if they have not enabled the Calendar service. And because syncing did not work, a Facebook applet I tried was also not working properly—I’d prefer that TimeBridge warn me about that, too. The program also does not work on legacy Macs, such as my older iBook G4. It only works with Leopard on Intel-based machines. The program really should be more flexible and run on just about any Mac—for any meeting. That said, scheduling a meeting is free, and serves as a kind of advertisement for TimeBridge’s paid Web conferencing tools. If a meeting organizer decides to hold a Web conference, he or she can sign up for the TimeBridge Personal Conferencing Service for $9 per month. The organizer can also set up a phone conference, use an online calendar-sharing mode, make a presentation, or conduct a demo. TimeBridge has revenue-sharing agreements for phone conference calls, and the company receives a small portion of the long distance charges. While this is a clever arrangement, it’s hardly unique: many other tools provide the same cross-application meeting request functionality. For example, Google Calendar lets you arrange meetings without forcing the attendees to sign up for the Google scheduling service. You just send invitees a meeting request and they click Yes, No, or Maybe. Yahoo! also offers meeting invites without any registration, although you do have to RSVP through the calendar.yahoo.com interface as a guest. I’m a big advocate of tools that bridge the divide between software programs. TimeBridge does accomplish that goal, and it’s free. I recommend it as a quick way to organize a meeting when you have no idea whether the prospective attendees are using a supported scheduler. However, for a schedule syncing tool, my advice is to stick with iCal or Google Calendar. They offer powerful features, work reliably, and keep even a hectic schedule from spinning out of control.